Give your customers the ultimate outdoor gift at your next outdoor event! 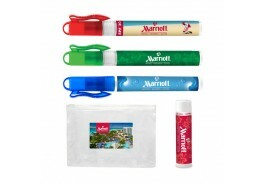 Our Fun in the Sun Beach Kit contains everything you need for a successful day at the beach or company picnic. 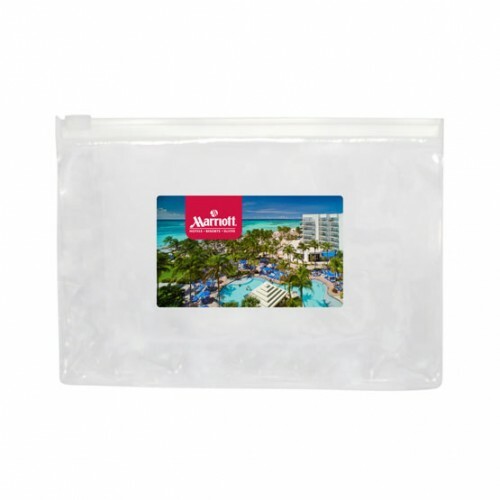 Included in the kit is a promotional sunscreen, lip balm, hand sanitizer and insect repellent, all conveniently contained in a clear 6 ½” zippered bag. Everyone can use it during your event, and take it home as a reminder of the fun they had that day! Once the items are depleted, the bag can be reused as the recipient sees fit. Our custom SPF 30 Sunscreen Spray and SPF 15 Lip Balm protects from harmful UV rays, while the Insect Repellant Spray keeps away bothersome insects for a more relaxing day. The Hand Sanitizer Spray will come in handy so you can go from play time to dinner time without worry! The setup charge includes a full color imprint on each item, as well as a full color label on the bag – with no run charges! 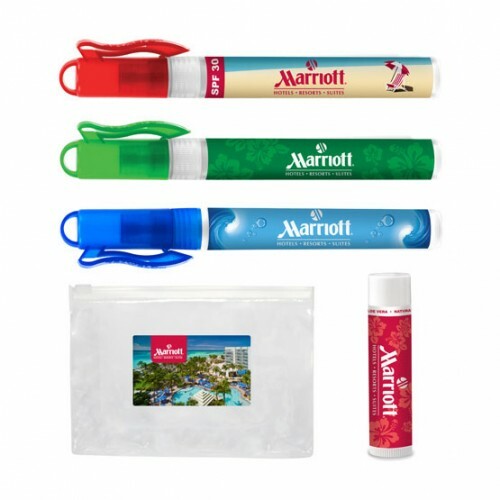 Custom promotional sunscreen makes a great giveaway for tradeshows, golf tournaments, company picnics, sporting events, or any other outdoor event. If you would like a proof before you place your online order please email the artwork and any instructions to: info@promowebstores.com (one item free art proof only). The remaining proofs will be created once we receive your online order.